Open day 2017: time to shine! by Cecilia Voss, Phd student. 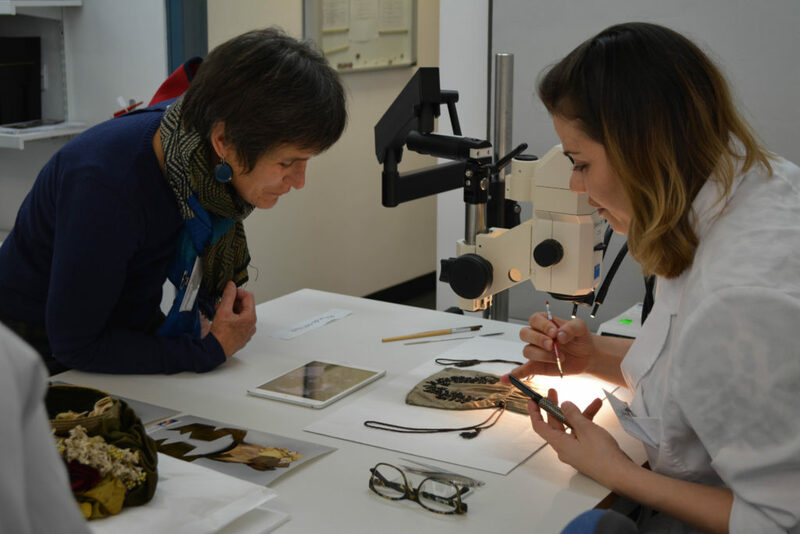 Training to be a textile conservator is a full-time, life changing commitment and so the Centre for Textile Conservation and Technical Art History Open Day is a well-deserved opportunity for the students to really shine. In front of friends, family, funders, clients and professional colleagues, the students were able to present the fruits of their labours and share their newly acquired knowledge and expertise. It was my fourth Open Day and this year I was there in my new role as a PhD student. 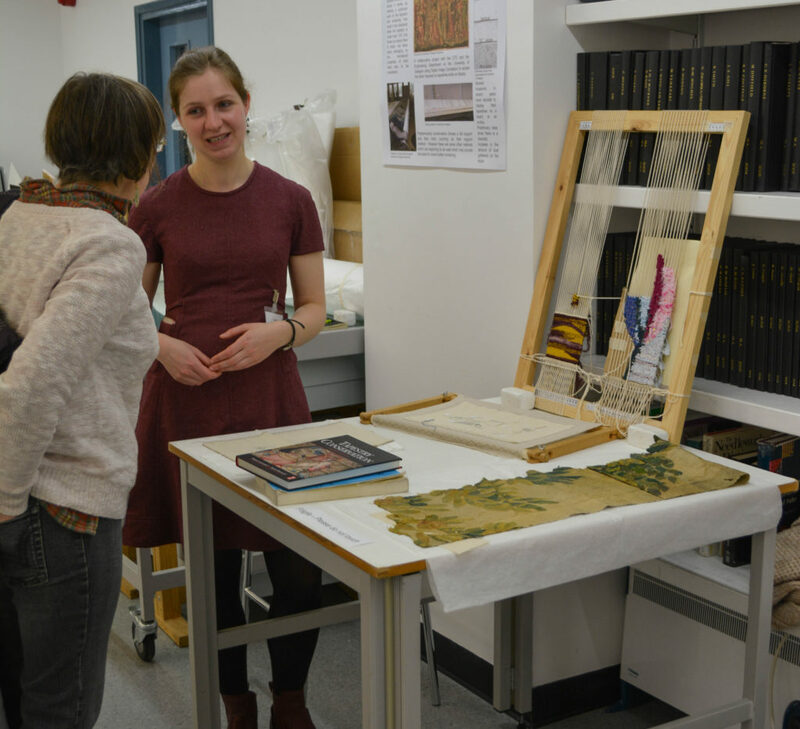 But I was no less amazed by the scope of the work on display, ranging from an 18th Century tapestry fragment to a piece of 1930’s Celtic football club memorabilia and from Pacific barkcloth to British samplers. 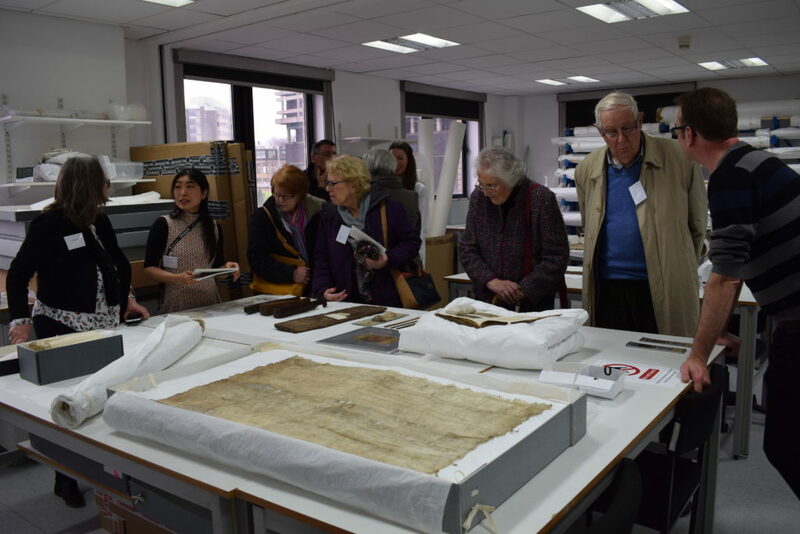 Misa Tamura and Andy Mills sharing their experience of Pacific barkcloth with visitors ©University of Glasgow, 2017. 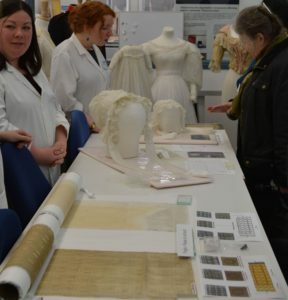 The first years had a spectacular display of costume they had mounted in collaboration with Maggie Dobbie, textile conservator at Glasgow Museums. She had been incredibly impressed with their work and it was easy to see why. They had padded torsos, made petticoats and arms to create museum worthy mounts. 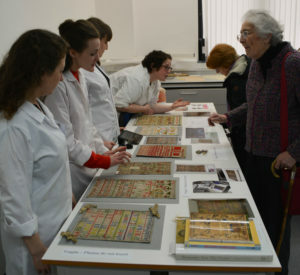 They also had a spread of samplers and bonnets that had been wet cleaned and painstakingly conserved. 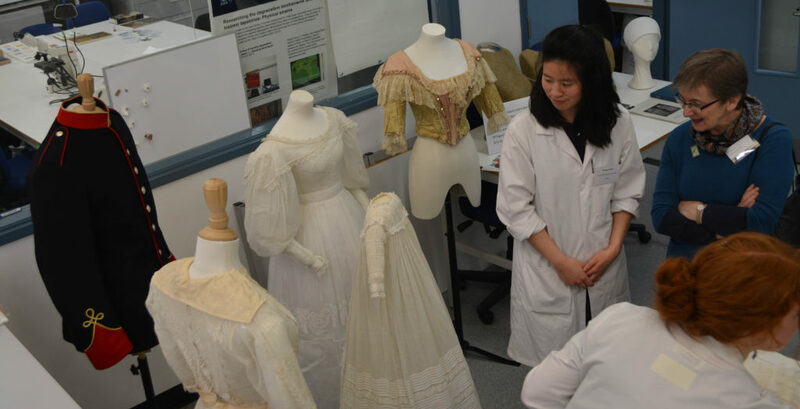 Staphany Cheng sharing her experience of costume mounting ©University of Glasgow, 2017. First years in animated discussions about bonnets and samplers ©University of Glasgow, 2017. 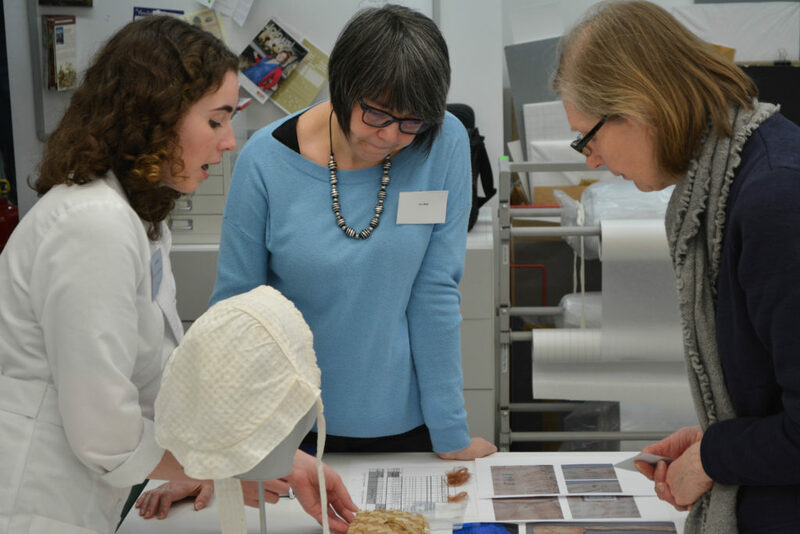 In the second year workroom, there were examples of how much the students develop over the two years, including another bonnet. This one, conserved by Beth Knight, had been damaged by mould which fluoresced spectacularly under UV light. Using a combination of spot cleaning, wet cleaning and conservation bleaching techniques Beth had achieved a remarkable improvement in the visual appearance of the bonnet, while preserving some red threads on the ribbons. Equally as astonishing at the other end of the workroom was a seal gut parka. One of my classmates conserved one of these in our second year and it was interesting and nostalgic to see someone else deliberating over the similar conservation decisions. Describing seal gut as the ‘original Gortex®’ because of its breathable but waterproof qualities, Aisling Macken was full of infectious enthusiasm about the challenge that was facing her in the shape of a very tightly folded, very fragile, very unusual object. Beth Knight explaining her bonnet treatment ©University of Glasgow, 2017. Aisling Macken shares her decision making conundrums ©University of Glasgow, 2017. Cristina Prelle discussing the intricacies of her cleaning strategy ©University of Glasgow, 2017. 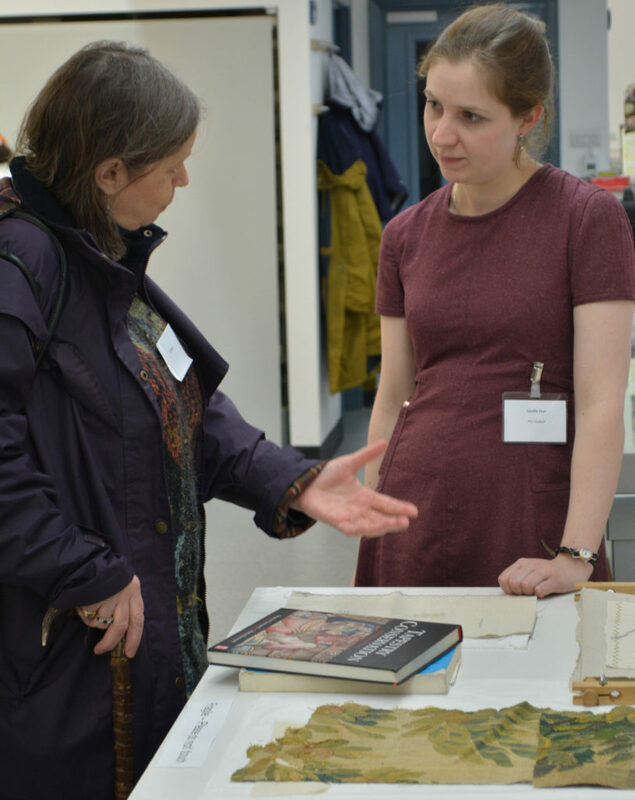 My PhD research, a collaborative project examining mechanical strain on historic tapestries, likewise attracted a lot of interest. I was able to participate in some enlightening and complex conversations about the developments of my research. I received many helpful suggestions on resources and thoughts on how to make my research useful. It tied in well with the range of research projects up the stairs, where Jing Han and Julie Wertz demonstrated what a completed PhD looked like both in terms of their research and the ways in which their careers had developed since being announced ‘doctors’. 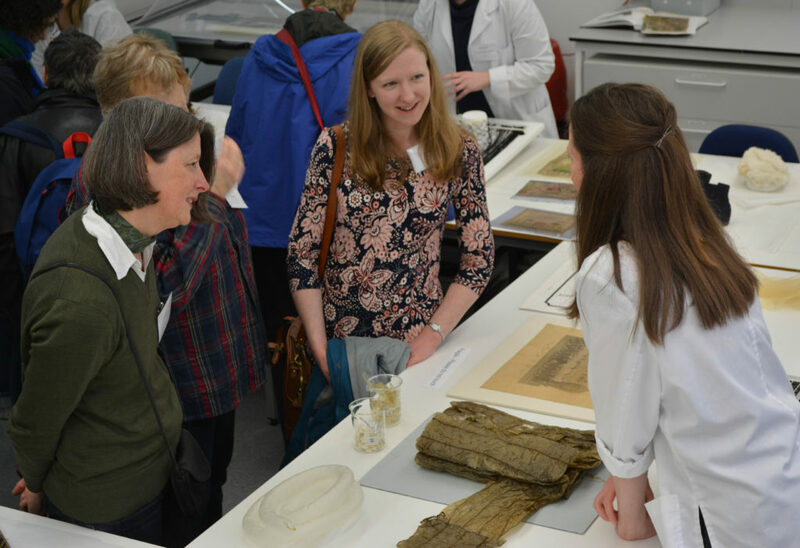 Me discussing my research with visitors and colleagues ©University of Glasgow, 2017. It is really inspiring, as a student in between MPhil and PhD to be able to assess how the students at the Centre progress and the dedication shown by MPhil students, PhD students, researchers and tutors. 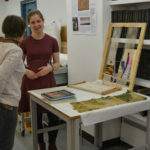 Next year will be my fifth open day, the second years will have jobs, the first years will be working on increasingly complex objects and we will have welcomed a new intake of budding textile conservators. I look forward to looking on to another year’s progress. Loved all the day, Frances and Team, it was beautifully arranged and we enjoyed it all very much. Thank you for a most interesting day. Best wishes for the rest of the twelve months until next year!